It's very easy to take things for granted as a developer. We almost always try and use libraries for every and anything to not reinvent the wheel. As I continue to grow, I find myself with a desire to dig deeper and understand the "black boxes" I've come to know. Recently, a beginner friend came to me needing a very simple authentication system. I told him about basic HTTP authentication to which he replied, "Sounds cool! How does it work?" I realized I had no idea and pulled up the spec. This one's for you, Zack! If the header is not present, the server will send back a challenge header and HTTP status code 401 (Unauthorized). WWW-Authenticate: Basic realm="Message to display"
This is all it takes to make the browser magically display the sign-in prompt! Upon submission, the server will do the encoding and resubmit the request with the header! Here's a full example for express. And you know what? Let's add the sendgrid-node library to email us with the IP address of unauthorized attempts! 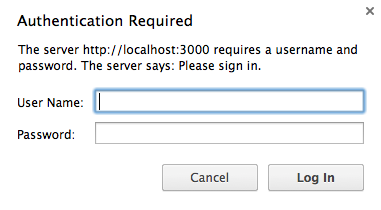 Now run it, node app.js, and visit localhost:3000 in your browser! Be sure to reach out on twitter if you have any questions!